On the Los Angeles Times Culture Monster blog, Diane Haithman writes about an upcoming scented theater production. It’s Kenneth Lin’s Po Boy Tango which is being premiered by the East West Players at LA’s David Henry Hwang Theater. During the show, which has a cooking theme, the theater plans to pipe into the house the actual scents of traditional Chinese cooking—ginger, garlic and such. The innovative American director and stage designer David Belasco was an early adopter of olfactory special effects. In 1897, he directed a play set in San Francisco’s Chinatown. His staging impressed the New York Times: “The senses of sight, hearing, and smell are violently appealed to for the sake of creating an illusion; for the perfume of Chinese punk fills the theatre and the music is as Chinese as possible.” . . . In 1912 he created a detailed stage replica of a Child’s Restaurant (a then-famous New York chain), complete with a working stovetop on which the restaurant’s specialty pancakes were prepared during the show. 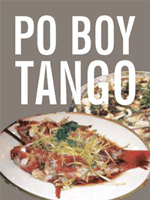 Tickets and performance dates for Po Boy Tango are available here. To get to the Hwang Theater from the beach, take the 10 to the 110 to the 5 and exit at Los Angeles Street. Well the directions are precise but God only knows how long it will take you to get somewhere in the entirely unpredictable traffic. Sounds great. Good thing it's near Chinatown. I predict a mass exit to the nearest restaurant.